Our Solicitors specialise in Personal Injury Claims, often caused as a result of slips and trips, either in public or at work. 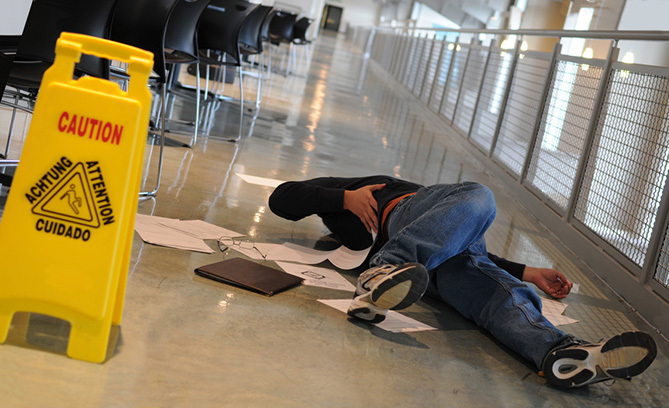 If you have suffered an injury due to slips and trips you may be entitled to compensation. The location where your accident happened helps determine who is responsible. If you were outside in public when you slipped or tripped this is Public Liability, meaning it is the responsibility of the local authority (local council, highway maintenance, etc.). If you were inside when the accident happened, perhaps it was an accident in a supermarket or other private building, it is the occupier, or owner, who is liable and responsible for your safety. The duty of care they must provide includes ensuring all walkways are clear and hazard-free. This includes clearing spillages, wiring, maintaining good conditions of floor surface, ensuring no objects are causing obstructions, etc. If the safety procedures are followed correctly, there should be no risk of slips and trips. If however these regulations are not adhered to and as a result causes a slip or trip resulting in Personal Injury, you will be liable for compensation. If you’ve been injured as a result of a slip or trip, contact us today. Our Solicitors will work hard to ensure your claim is processed as efficiently as possible and you receive the maximum amount of compensation for your injuries and losses. You can complete the simple claim form to the right, select ‘contact us’ above, or speak to a member of our team by calling 0800 1123 256.